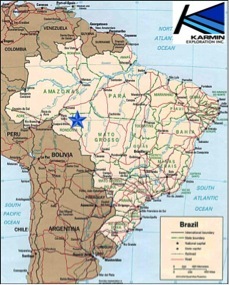 Karmin owns 100% of the Aripuana Gold Project which encompasses both gold and silver mineralization associated with the near surface oxidized portions of the numerous massive sulphide deposits in the 820 square kilometre Aripuana Zinc Project located in north-western Brazil. The Aripuana Gold Project has significant exploration potential for near surface gold deposits. Exploration is expected to commence at this Project as the Aripuanã Zinc Project advances. The The Aripuana Gold Project has significant exploration potential for near surface gold deposits. 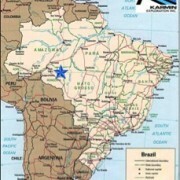 Located 25 km from Aripuanã city and 1000 km by road from Cuiabá in Mato Grosso State as shown in the map below.